After WCMC reported on Dr. James Kroll, a Texas wildlife biologist hired by Scott Walker as a “Deer Czar” to advise on Wisconsin’s deer management policies, Kroll came under intense scrutiny by not only the citizens of Wisconsin, but national media who picked up on the local story to spread it all the way to Texas, where “Dr. Deer” lives. But Kroll misses the point. The issue is not Kroll’s motive in accepting the position of Deer Czar, but Walker’s motives in offering it. There is no doubt that Dr. Kroll is a well qualified wildlife biologist and an expert on whitetail deer. But why would Walker need to go to Texas for such expertise? Surely, if there is a state that knows deer, it is Wisconsin. Kroll himself has said as much. Could Scott Walker just be the latest product that Kroll endorsed? This seems likely. By all accounts Kroll has not actually put much time into Wisconsin since taking the job as Deer Czar. He was not even in the state during the 9 day deer season in 2011. His preliminary report on deer management was short and perfunctory, and demonstrated that he has not put much effort into learning about the state and its hunting history. This lack of care and effort suggests that Kroll’s true role is not to actually study Wisconsin, but to provide a celebrity endorsement to policies that have already been devised. Kroll is here not to advise Walker, but to sell him to hunters. There is nothing underhanded or unethical in Kroll endorsing products that he believes in, nor in him profiting from those endorsements. But if Kroll believes in Walker the way he believes in the Boss Buck Feeder System, where does that leave hunters? This leads us to the second reason why Walker turned to Kroll: Walker could rely on Kroll to give him advice that would advance Walker’s own political agenda. In Kroll’s response to our story, he claimed that he would never support any policy that worked against the best interest of deer, deer hunters, and rural communities. The problem is that there are many conflicting ideas about what is in the best interest of these three groups. Kroll’s own ideas strongly favor game farms and private management over viewing deer as a public resource. These ideas are in line with Walker’s passion for privatization, but are at odds with Wisconsin’s traditional public game management. Walker’s vision is so alien to Wisconsin tradition that it is no wonder that he had to go to Texas to find a kindred spirit to endorse it. Despite vaguely worded denials by DNR Secretary Cathy Stepp and Walker spokesman Cullen Werwie (and their friends at the slavishly pro-Walker Milwaukee Journal-Sentinel), there is every reason to suspect that Walker is planning a radical revision of Wisconsin’s deer management policies, along the lines of those favored by Kroll and recently implemented in Texas. Although Walker claims that his goal is to listen to hunters and incorporate their concerns into policy, he has steadily worked to reduce citizen input into environmental and conservation policy by, for example, stripping the Conservation Congress of power. Consistent with these efforts, Walker has set up Kroll’s position in a way that will exclude public input on the new policies once they are drafted. In other words, no one other than Kroll and his team will be consulted before Walker and the Legislature start implementing his recommendations. The DNR will be cut out of the process. There will be no meaningful public hearings on the proposals once they are written. While Kroll has been taking input from hunters before he issues his report, once it is issued that input ends. Instead, Kroll will report directly to politicians, people who know nothing about science and are not in a position to judge the quality of Kroll’s work. We have no doubt that Kroll will produce a report that he believes is fair and accurate, nor that much of his advice will be sensible. But this does not mean that Kroll’s report will not be heavily flavored by his own views on the controversial issues it will discuss, and especially by his contempt for public game management. Walker is counting on this. Once it is in their hands, politicians will pick and choose among the Kroll report’s findings for items that benefit them, their party, the well-heeled lobbyists for game farms, and everyone other than the average hunter. This is a recipe for chaos. We originally claimed that Kroll has “considerable power” over deer management policy. This was an understatement. He has near-absolute power, and the ability to completely bypass the normal process of making changes and impose his own vision of what is best for the deer and best for the hunter. 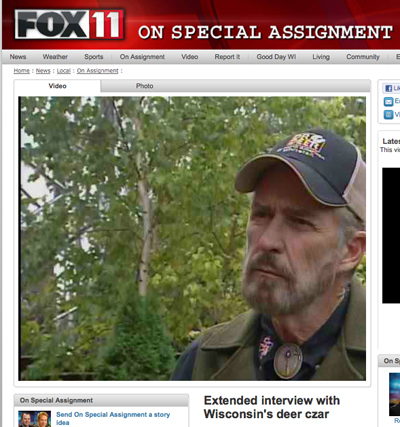 Deer hunters who thought that the DNR was dictatorial soon will learn what life is like under a Czar. We really need to be referring to Kroll by his full name, “Dr.Deer, Inc.” Wisconsin is part of the territory of the corporation’s “Great Lakes Division”. Would you like to know what I get paid to manage the drdeer.com site? Why don’t you stop guessing at all of this stuff and ask Dr. Kroll questions. And one I would start with is how the name “drdeer” came about. Listen to what he says in the video, he is tired of companies stating claims on their product and not able to deliver. As a result the consumer is getting ripped off. So some one is looking out for the hunter and consumer and it is twisted around as a bad thing. You miss the point. The article specifically said that there was nothing wrong with Kroll endorsing products that he believes in. The problem is that, whether he knows it or not, he is being used to endorse a product called Scott Walker. I always have made it my policy not to become involved in political issues; politics often is a dirty game and I have no taste for the rules. My propensity, however, to come to the aid of the underdog has, on occasion put me in a position demanding participation. The white-tailed deer is my life, second only to my family and my God! I owe a great deal to whitetails; and my 40 years of work with these wonderful animals and the great men and women who hunt them has been a blessing. My father taught me three rules of life—know your convictions, stand strongly on them and always speak your mind and the truth. These simple rules got him through the 74 years of his life and they have served me well over the last 65 years. He was my hero, coming home from the Pacific theater all shot up and with very little interest in hunting anything. I had to learn to hunt on my own and thankfully under the kind eyes of two mentors, my Uncle Spencer (“Butch”) and a high school biology teacher, Mr. Victor Rippy. My family on both sides were small farmers, often harvesting game for the table rather than sport. I tell you this to make clear my feelings about animals and about people of the land. Recently, I have heard about things being said in blogs, presumably to aid successfully removing Governor Walker. Since I am not politically motivated, did not vote for Governor Walker, will not be able to in the up-coming election, and am neither a Democrat or Republican, I am concerned and saddened by things being said about me and my positions and values related to white-tailed deer. Although there is no way to combat anonymous postings on Internet blogs about me, I can speak in a straightforward manner what my positions are and will continue to be. Wisconsin is a marvelous place with some of the most beautiful places I ever have experienced. I have enjoyed my time with the hunters and landowners of this fine state. It was the highest honor of my career to be asked to be the “Deer Czar,” and I have said that many times. I take this responsibility seriously and view it as an opportunity to end my career by giving something back to the animal and the recreational pursuit that has shaped my life. My career has been full of experiences, involving a diversity of people, places and activities. I made the decision early on NOT to be a typical college professor; instead of the ivory tower existence of publish or perish, I opted for working with people in almost every state and province from Mexico to Canada. It has been my joy to hunt whitetails in every habitat and with every legal weapon. I have hunted on public land and on private land. My passion has been to hunt Crown land in Alberta and Saskatchewan, where the climate is brutal, the hunting is very difficult and the deer are the most challenging. At the same time, I have worked with both small and large landowners to make their lands better for deer, rather than converting the properties to pastures or shopping malls. As a consequence, it has been amusing and frankly frustrating to read or hear someone pronounce me as favoring one group or interest over another. Although my deepest feelings are my own, I think this is the time to firmly and completely express what my values and philosophies are. First and foremost, every decision I make regarding deer is based on the answers to three basic questions: 1. Is this good for deer? 2. Is this good for the recreational activity of deer hunting? 3. Does this save undeveloped land and the rural lifestyle? If the answer is no to any, I turn and walk away. Since I grew up in rural central Texas, I fully understand what being poor is! Hunting was more than recreation, it was a way of life. I am committed to the idea, in order for hunting/fishing to prevail, we have to develop ways to provide outdoor opportunities to all citizens. Public lands should be more than just space where hunters can spend time, they should be managed for quality experiences, especially by young boys and girls who may have grown up like me. Public lands often are the places where Native American hunters have to seek the plants and animals to which they have every right, by law and by what is right. But providing public hunting and recreational opportunities are a challenge in today’s world, and will have to involve partnerships between agencies, landowners and hunters. That is why I asked Drs. David Guynn and Gary Alt to assist in this great venture; a capstone for our careers. They represent not only the breadth of experiences needed to assure we truly do develop a 21st Century model for deer management and hunting, beginning in Wisconsin, but also the integrity and moral character so common to sportsmen and women—a model in which there is a place for everyone wanting to enjoy our passion and lifestyle. There is no place in this model for pitting hunters against each other or hunters against landowners! There only is a place for a brotherhood and sisterhood of outdoors people who truly love the land and our deer. Our report and recommendations will stand on the side of the public, offering a bottom-up approach to wildlife management; one in which individual hunters and landowners have a say in how resources are managed. Our recommendations will be delivered in June to the Governor’s office and will focus on this high ideal; one I never will back away from. My Dad would not be happy if I did. One of the most egregious postings was on a self-proclaimed “liberal” blog. Until now, I never have read either a liberal or a conservative blog; no time for that nonsense. However, I was sent this posting and upset by the lies presented in it! Is this what has led to the contentious times we live in today? The “author” of the blog distorts the truth beyond belief. The blogger rails on about me hating public lands, hating public land hunters, and most egregiously being disdainful of hunters! Not only is this not true and the facts not even close to correct, they even get my age wrong (not 55, rather 65). Even more disturbing was the undertone of the writer demeaning hunters. I cannot undo this slander, but I can be clear. If you read my words above carefully, you should understand where I stand. I STAND WITH THE SPORTSMEN/WOMEN OF WISCONSIN, I STAND WITH THE RURAL LIFESTYLE, I STAND WITH HUNTING/FISHING RECREATION, AND I STAND WITH THE WHITE-TAILED DEER! I’m happy that you just shared this useful information with us. Please stay us up to date like this. Thanks for sharing.